March 5, 2019  Recommended if you like Santigold, MIA and Gorillaz. 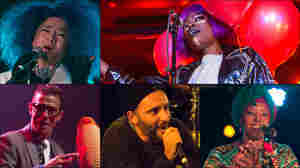 January 10, 2017  Every January, we hear some of the world's tastiest acts at a one-night showcase in Manhattan. From Korean folk songs spun into glam-rock glitter to blazing Cuban brass, this year was no exception.